There are many waterfalls at Springbrook National Park in Southern Queensland, but if I had to pick a favourite it would have to be Twin Falls, a 40 metre drop on the Eastern side of the escarpment. The two waterfalls then cascade further down the mountain, as can be seen to good effect from Canyon Lookout, just off the main Springbrook road. 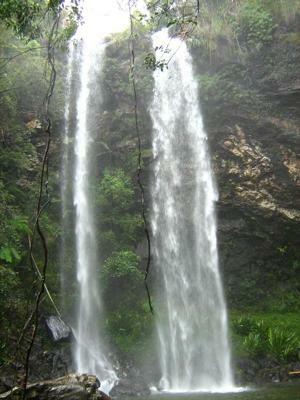 A 4.5 kilometre walk departs from Canyon Lookout, first crossing the top of the falls, then descending through sub-tropical rainforest to a rock pool at the base. Along the way it passes two or three other waterfalls that are also well worth a visit, as are the views from the top of the escarpment.